Those opposing the transition to clean, distributed renewable energy resources routinely point out that these alternative energy sources couldn’t survive without government subsidies. 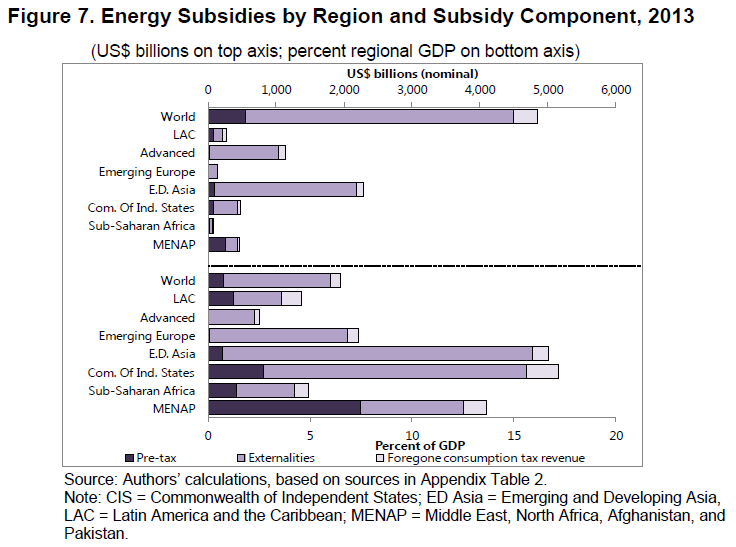 What they routinely omit is that fossil fuel subsidies far exceed those for renewable energy and have for many decades. 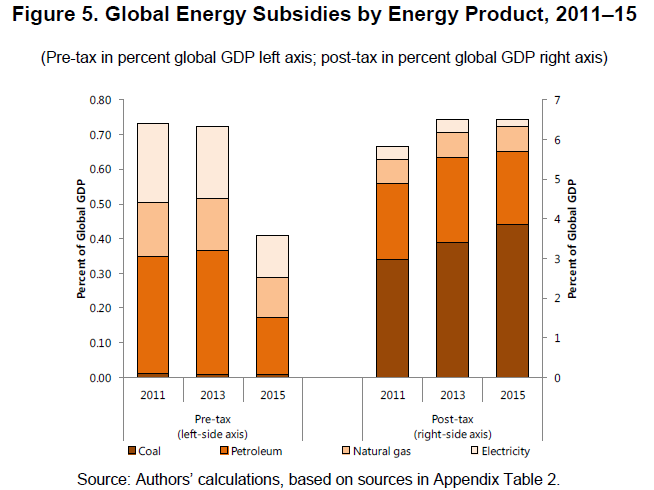 Fossil fuel subsidies run directly counter to the “polluter pays” principle. Phasing them out, moreover, would be a big step forward in the global effort to reduce greenhouse gas (GHG) emissions and reduce the destructive impacts of fossil fuel development and use on critical ecosystems, in terms of natural resource degradation and in terms of its detrimental impacts on human health and well-being. Releasing the results of new research, the IMF (International Monetary Fund) determined that government fossil fuel subsidies are dramatically higher than had been previously estimated, totaling a “shocking” $5.3 trillion. That’s more than all the world’s governments collectively spend on health care, IMF highlights. Fossil fuel subsidy reform and accounting for the high, long-term and unaccounted-for costs of fossil fuels was also the subject of an all-day workshop organized by the U.S. Council on Foreign Relations (CFR), an influential New York-based think tank. In early May CFR’s Maurice R. Greenberg Center for Geoeconomic Studies brought together 20 experts from around the world to discuss challenges, opportunities, and strategies of fossil fuel subsidy reform. Hosted by CFR Senior Fellows Michael Levi and Jennifer Harris, CFR summarizes the discussion and highlights key points in a report. Here’s a rundown. Worldwide, fossil fuel companies benefited to the tune of some $548 billion in fossil fuel subsidies in 2013, far more than those granted to those in the fast growing renewable energy industry. Fossil fuel subsidies in just 10 nations – five of which are in the Middle East and North Africa – account for roughly 75 percent of the global total, CFR workshop participants pointed out. Fossil fuel subsidies in these countries, CFR continues in its report, “drain national coffers, spur additional domestic consumption, and threaten future resource availability for export.” As a result they present a security risk to the governments of Saudi Arabia, Kuwait, Iraq, Iran and the United Arab Emirates (UAE), CFR highlights. By distorting market prices and spurring consumption fossil fuel subsidies are also the main driver of ongoing growth in global GHG emissions and hinder global efforts to mitigate and adapt to climate change, CFR panel members added. On a positive note, CFR panel members noted that some governments have taken steps to reduce fossil fuel subsidies. “Notably, countries such as India, Egypt, Kuwait, Oman and Bahrain have recently taken steps to start unwinding some subsidies.” Furthermore, governments, such as much troubled Venezuela’s,”acknowledge the need to overhaul fuel subsidies.” Others, including Saudi Arabia, continue to resist calls phasing them out, however. The IMF and CFR’s reports on fossil fuel subsidies and reform come in advance of much anticipated 21st UN Framework Convention on Climate Change (UNFCCC) Conference of Parties (COP-21) to be held in Paris this December. There, climate negotiators from more than 195 nations will try to hammer out a global climate treaty that will cap GHG emissions at a level that will enable humanity to avoid reaching a climate change tipping point. While lowering the cost of fossil fuels is a populist measure intended to quell public discord and discontent, fossil fuel subsidies are costing societies worldwide a great deal. In addition to perpetuating fossil fuel-based economies that are devastating fundamental ecosystems and driving climate change, they are hindering alternative, clean energy R&D, investment and deployment, which is spurring sustainable development, economic growth and local “green” job creation in countries the world over. Subsidies and efforts to reform them are both contagious. Some energy-importing Middle Eastern countries mimic neighbors and embrace cheap energy as a birthright, despite little or no domestic energy production. Other participants noted that initial stabs at reform, once shown viable and beneficial, often prod neighbors to undertake reforms themselves. The United States is among the loudest voices calling for reform. Yet such admonitions are undermined by continued production subsidies for fossil fuels in the United States. The G20 has been at the forefront of calls for reform, but may not be the best forum to actually drive progress. Fossil fuel subsidies are a second-tier issue when the G20 is confronted with other more immediate or urgent crises. Leveraging technical ability to establish cash transfer mechanisms and independent price-setting schemes free of political interference. They added that in order to increase the likelihood of success, it is important to “front-load” as much of the benefits resulting from fossil fuel subsidy reform as possible. “These strategies, most participants agreed, would help protect the vulnerable while spurring more durable subsidy reform,” CFR concludes.